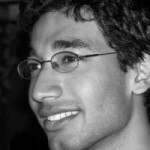 Vamsi Krishna began Lakshya(http://www.lakshyainstitute.com/), along with three other friends Saurabh Saxena, Pulkit Jain and Anand Prakash (schoolmates and batchmates at IIT) at the age of 22. They had dreams of starting something from their second year onwards, but due to parental and society pressure, they landed jobs out of campus. They were working for 6 months and realized that they were not cut out of employment and took the plunge into entrepreneurism. Vamsi says that the decision to do an educational startup was not intentional and planned but they did so because two of the other founders were working out of a remote place called Barnala (Punjab) and they found out that education was a huge opportunity there. The four founders had passion in teaching and they were also mentoring kids for their preparation and the parents of those kids used to ask them if they can train them continuously and the intersection of the place and their passion led them to begin Lakshya in Dec 13, 2005. The founders recollect the early days when they met parents, they faced a lot of resistance from the parents because none of the founders had a formal teaching background. The founders had to do quite a bit of convincing that they themselves are all from IITs and they have been teaching and mentoring kids and had to meet lots of parents to succeed. Vamsi says that entrepreneurs need to be hustlers themselves as none of the early stage startups can hire sales and marketing people. They remember the four founders to have only INR 5 lakhs amongst them as capital. They also say that the founders need to be hands on with the first few customers acquisition which will trigger the feedback loop and will lead to a quicker product market fit. They say that If the founders do not know what the customers want, it will not be possible for them to create a business that the customer wants. The four of them began interacting with the school authorities to find out if the school principals, teachers and parents really needed this or not. Even though the feedback was very positive, they realized that almost all of them were only aspirational but they also had a small place attitude that institutes in the small cities will not be good in quality and hence people there gave up their hopes and were contended to study in normal colleges. Realizing that they had to spend a lot more time and energy in creating a new market which they could not afford at that point in time, they took an important decision of moving their location to a larger city – Patiala and hoped that they will also get better students. They went again to the principals and spoke with the Maths, Science HODs and also to the parents. The feedback they got was slightly different where the school authorities were ready to educate the children but they were losing them to places like Kota, Chandigarh and Delhi because of the perception that those cities provided better education. So, they found a great opportunity and the founders did extensive awareness seminars in the schools and glamorising the right aspects of studying in the right school. They also began working with the schools and train the kids so that the school does not lose kids and this began working like magic. They say that they would have never got this input without them talking to many people early enough. In retrospect, they say that choosing a virgin and a small market worked in their favour. In March 2006, they began their first batch which was a crash course batch for that year. In that morning, they were sceptical on how many would come in, but they were surprised to see more than 100 students lining up for the course which gave Lakshya the first burst of money – INR 7 lakhs and that gave the founders a lot of confidence in the entire business model and the viability. The four of them gave their best in giving the best content and education which led them get good reputation in the market which got them the first few batches and they never looked back after that. 12 students went to IIT in the first batch. Vamsi’s advice to startup founders – Go out and speak to the target audience as soon as possible launch something real fast as people will give you specific feedback instead of generic ones and that will help you to better the product to suit the markets requirements. Don’t think of perfecting your product and then hope to launch and that is where most of the startups fail. Lakshya over the next seven years trained over 5000 students and sending many students to IITs and they realized that as entrepreneurs , they believed that technology could be a good way to train more students and hence did an exit of Lakshya with Mahesh Tutorials and began another education venture Vedantu. Lakshya has been covered extensively in the media. They were the Tata NEN hottest startup of the year 2009, FYSE Asia’s Top 100 Social Entrepreneurs , Franchisee world Top 100 Small and Medium Companies and the business case study was taught at ISB, Hyderabad on how a business can start from a virgin market and can scale, and also featured at Darden school of business, USA. After the exit, the four founders started another education venture(www.vedantu.com). an Online education company which specializes in providing LIVE 1-to-1 Tutoring. The interview for Vedantu will be published shortly.